The Kirkaldy museum in London have been torturing some materials using artists and test equipment. The Kirkaldy museum preserves testing machines designed to perform mechanical tests on finished engineering components. It is the site of the testing house established by David Kirkaldy (1820–1897) a Scottish engineer who pioneered the testing of materials as a service to engineers during the Victorian period. In Southwark, London, a large hydraulic tensile test machine was constructed to measure the mechanical properties of engineering components. The moto of Kirkaldy’s test house was “Facts not opinions”. The Kirkaldy works tested components for the 1874 Eads Bridge across the Mississippi River, and for the Skylon that was built for the nearby Festival of Britain in 1951. It also helped accident analysis by tested materials from structures that failed, including the Tay Bridge Disaster of 1879 and the BOAC Flight 781 De Havilland Comet crash of 1954. 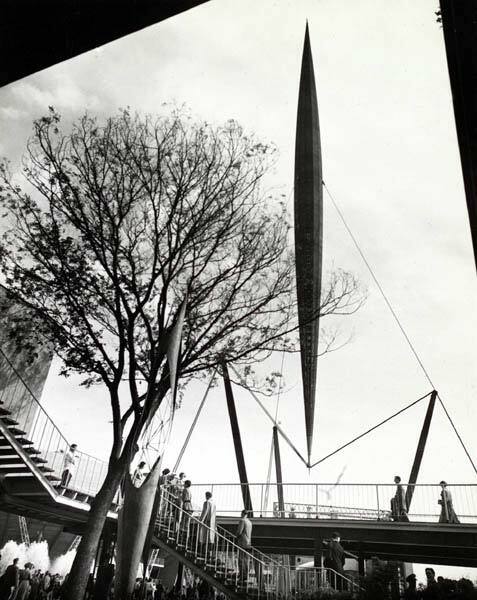 The Skylon (image from wikipedia). Tesla S has a three phase AC induction motor, 1 speed gear (9.73:1). It comes with 60 or 85 kWh lithium ion battery. 56,800 units have been sold worldwide as of Dec 2014. The EPA rates energy consumption as 237.5 Wh per km, giving a combined fuel economy of 89 miles per gallon of gasoline. In their marketing they claim this as 0 CO2/mile. Since the electricity can be made by different methods that is fair, moving cars to electric power is one way to substitute renewable energy for ‘fossil fuel’. At the moment though much of our electricity is produced by burning fossil fuels, we need to consider another number then, how much CO2 is produced in delivering a kWh of energy to our home. France has 76.6 % Nuclear power, 10.2% Hydro, 4.47% non-hydro renewable, 4.08% coal, 3.69% gas, 0.58% Oil. In the UK electricital power is mainly generated from burning gas, coal and oil, with 15-20% produced from nuclear power.